It can be hard to know what the future will bring. Economic and political drivers shift, seasonal trends come and go and employees’ circumstances change. But if there’s one thing for sure, 2015 certainly won’t be a boring year for benefits. There’s plenty in store for small businesses, including cost-reducing strategies and dynamic workforce needs. Here’s the pulse on what small-business leaders can look for in the year ahead. 1. Exchanges take center stage for simpler benefits administration. Health insurance exchanges (also called marketplaces) are now part of the employee benefits equation. Especially if you’re a small business, these options can provide tax advantages and do some of the heavy lifting usually associated with offering employee benefits. Privately run exchanges are gaining traction and are expected to surpass enrollment in the government exchanges. These online private marketplaces have grown in popularity because they can offer a mix of benefits products and help to reduce an employer’s time spent on administration and paperwork. For example, voluntary supplemental benefits, such as accident or hospital indemnity coverage, can be offered on a private exchange but not on a government exchange. Separately, government exchanges are expected to open Nov. 15, 2014. Though these marketplaces had a rocky start in 2014, they can offer tax advantages for certain small businesses – making them an increasingly popular option in 2015. In some states, small employers can even offer benefits with an “employee choice” option to give their workforce more say in their benefits selections. Bottom line: Take a look – these may be a great fit. Exchanges can make benefits administration easier for small businesses. Plus, they give employees the option to purchase health care coverage that fits their needs and their budget. If your company has fewer than 25 full-time equivalent (FTE) employees, you may be able to take advantage of tax credits through government exchange options. And, regardless of your company’s size, private exchanges can help your company to offer a variety of benefits options. 2. Businesses turn to multiple strategies to control health care costs. Controlling costs is always a top priority for small businesses. In fact, 53 percent say it’s one of their top business objectives. So when it comes to rising health care costs, it’s no surprise many are looking to rein in costs whenever possible. In 2014, 24 percent of small businesses expected to increase employees’ share of premiums, and 24 percent expected to increase employees’ copays. Financial anxiety – 73 percent. Likelihood to consider a lower premium health plan - 72 percent. Job satisfaction – 69 percent. Likelihood to consider looking for a new job – 58 percent. High deductible health plans tied to health savings accounts (HSA) are growing in popularity. The number of people enrolled in HSA-eligible plans hit almost 17.4 million early this year, a nearly 12 percent increase since 2013. Additionally, 49 percent of employers offered a flexible spending plan to their employees in 2014, up from 37 percent in 2012. Health care reform doesn’t require companies to extend coverage to spouses, and some companies are cutting back on spouse benefits, especially if the spouse can purchase health care through their own employer. Nearly 1 in 10 (7 percent) of small companies eliminated contributions to family coverage in 2013, and 7 percent expected to do so in 2014. Similar to an allowance for employees to spend on the health care they choose, defined contribution is a way for employers to control the amount they pay towards benefits. If the employee wants more robust coverage than their employer’s contribution can cover, the employee can choose to pay the remaining portion of the bill. While many details surrounding defined contribution still remain to be seen, the model is gaining consideration, especially as exchanges become more popular. Bottom line: Strive for balance and effective benefits communication. Even positive changes to a benefits program can be confusing to employees, but not all changes need to have a negative impact. In fact, 81 percent of employees at small businesses at least somewhat agree a well-communicated benefits program would make them less likely to leave their jobs. To prepare for a smooth transition, communicate with employees frequently and develop a plan to touch base before, during and after a change takes place. 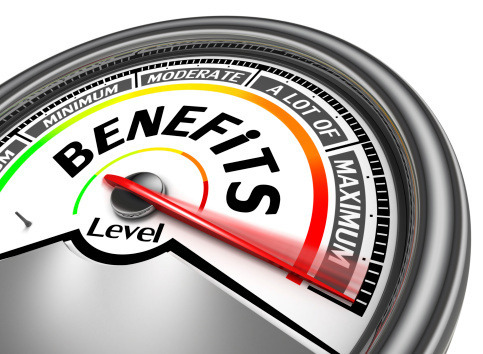 Keep in mind the value your benefits bring to recruitment and retention, and discuss your options with a trusted benefits consultant who can help you establish a plan that works within your budget. For two more tips on what to expect for changes in benefits in 2015 read this.